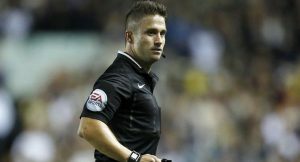 This week’s spotlight for our man in the middle falls on James Adcock, whom was appointed the referee for the Peterborough United v Swans English Football League Cup 2nd Round game on Tuesday, 23rd August 2016. Interesting Fact: Adcock is a relative newcomer to the football league having only graduated to the national list in the 2011/12 season. Ironically he has only been the man in the middle for a Swans game once before, against York City at the Liberty Stadium in – yes you’ve guessed it – round two of the League Cup!